It’s in Japan. Is it coming soon to the US market? It has long been my belief that the more a light lager resembled water the more popular it would be. With Bud Select 55 we are eerily close to this point in the USA. How far will it go? Well, if Japan is any indication of the future—and it usually is—it will go all the way down to zero. Several firms are battling it out already, including Suntory and Asahi. Of course they are also zero alcohol, as alcohol remains the largest source of calories in nearly all light beers. Within one week in August, Suntory received 400,000 orders of All-Free and had to suspend sales until September due to excess demand. 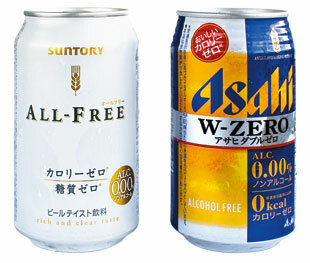 In Japan, it seems like light beer can actually be about refreshment. The only question is whether Americans actually like the taste of light beer enough to buy it when it doesn’t have any alcohol. Somehow I doubt it.